At KAP’s new Prestige Car Centre we offer our clients the opportunity to acquire the very latest prestige and performance cars available in today’s market. We offer a fantastic choice of the most desirable models across all of the prestige marque. With experience of over 60 years in the motor trade we’re confident that we can make buying your next prestige car a relaxed and pleasurable experience. Our experienced team ensure that you receive the best service possible..
At KAP’s Used Car Centre we have a wide range of quality used cars, which are all fully HPI checked and fully serviced with new MOTs carried out as a standard on all of our used cars. We offer warranties up to 3 years and pride ourselves in excellent customer service. With flexible finance packages and everything needed under one roof there isn’t anywhere else you need to go we’re a “one stop shop”. As a family run business for over 60 years we believe in a level of service that encourages you to return, bringing your friends and family along too. At KAP we have an extensive range of new vehicles varying from the Nissan Electric Leaf to the Sporty Peugeot RCZ. Our New Vehicle makes are Nissan, Peugeot and Suzuki. We All Hear Lots Of References To ‘Electric’ And ‘Hybrid’ Vehicles But Many Do Not Know How They Differ. In Simple Terms A Hybrid Car Gets Some Of Its Power From A ‘Normal’ Combustion Engine, Fuelled In The Majority Of Cases By Petrol, And On The Odd Occasion Diesel. An Electric Car (EV) Is What Is Called A Zero Emissions (ZE) Vehicle, As It Gets All Its Power From Electrical Sources. Speak To Our Specialist Team At KAP Motor Group For More Information, Better Still Organise A Test Drive From The Wide Range Of New And Used “Eco” Cars Available Through Our Showrooms. At KAP Motor Group we offer professional car servicing for all vehicle makes. We mostly use genuine factory parts to service your car for a much lower cost than some garages charge using generic parts. Which service would you like? What other services would you like to add? '; window.ServiceAPIData = data; var servicesOutputDOM = ' Which service would you like? Error, Please try again later! 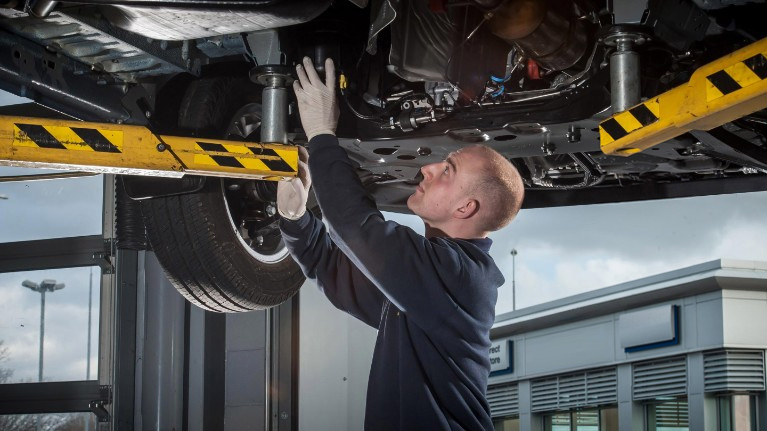 At KAP Motor Group we have highly trained technicians that know everything you could ever want about keeping your Ford safe and running brilliantly. As well as Ford cars such as the Focus and Fiesta we can also service much larger vehicles and can accommodate for MOT classes 3,4,5 light (mini buses) and 7 (light commercials) as well as motor homes. “Provide a level of service that will ensure you will return again and again, bringing your friends along too."